After having gone through whole body hyperthermia in Austria with a great success I wondered what I could do at home to keep high temperature treatments going to at least some extent. The question is how high in temperature can you get up a home without any professional equipment. I purchased a small portable infrared sauna at home that I use now about once per week now (I should do it more often, i.e. 2x per week) to get my body temperature up on a periodic basis. I experimented a bit with length of use and rise of body temperature. After about 40 min sitting in the sauna running at maximum temperature I get up to about 38 deg C or 100 deg F in temperature (measured orally). That could corresponds to as high as 39 deg C or 102 deg F core temperature (measured rectally), although it is unlikely given how long it took me in Vienna to get to an increase of 1-2 degrees Celsius. For me 40 min in the home sauna is about as good as it gets. I can't stay in there much longer, I just get too tired sitting and I want to lie down. So next I started to attend a commercial IR sauna where I could lie down. I was able to stay in there for about 2 hours. After that I started to crash. I stayed in the sauna for 2 hours, then drove straight home (trying to stay warm) and then went immediately for 3/4 of an hour or so into the hot bathtub, as hot as I can tolerate. That approach would split the heating time between bath and sauna. In general it seems that exposure to hot water is more draining to the body than heat provided via light or photons, even infrared light. I have noticed how fatigued I get when sitting in a super hot tub for long periods of time. After a while you can barely get out anymore. But at least in the tub it is possible to lie down and was at home, close to getting to bed. The combination of those two procedures seemed effective. There are now a many larger commercial infrared saunas available in gyms and spas that are lie down style and are more suitable for longer sessions. See the resources section under hyperthermia for more info. Another good option would be to do a Bikram Yoga session combined with a hot bath at home. However, one needs to be in bit of shape to make it through 1 hour Bikram, an not every Lyme patient can do that. Hi! I was on your blog learning about treatments and am wondering if I should just go straight to Austria/Germany. I've had Lyme since 2012 and was finally bedridden this summer. Starting penicillin injections now but I'm wondering if that will be enough and am sick of waiting to get better after 3 years... Do you think you could have skipped the Antibiotics and gone straight to the clinic and had the same results? I have listed my treatment protocol applied during the most critical healing period. It is optimized for Lyme with co-infection Bartonella and Ehrlichia. It is meant to be used as an EXAMPLE ONLY to show activities and supplements involved in the treatment. Reinhard is a mobile technology expert based in the Silicon Valley. He has always had a longing for deeper understanding beyond technology and has spent a great deal of time exploring fields such spirituality, philosophy, and science as well as health, nutrition, and herbs. He enjoys applying insights and approaches from different, unrelated fields to develop creative solutions, including applications for his own healing process. Having been infected by Lyme – probably acquired while hiking in Marin County - he was able to address his Borrelia related symptoms using a unique combination of conventional and alternative medicine. Reinhard has lived and worked on two continents and loves travelling, discovering new cultures, and exploring nature. He enjoys writing and has authored and published bestselling Internet handbooks in German language. All information provided on this website is for educational and learning purposes only, and is not to be treated as medical advice. No action should be taken purely on the information contained on this site. Please consult with your physician or health professional on any issues regarding your health or my ideas expressed in this website. Since every person is unique, there is no guarantee that any specific result will occur following the protocols that I generated for myself. If you have a medical concern, you should consult with a licensed physician. Never disregard professional medical advice because of something you have read on my site or any linked websites. 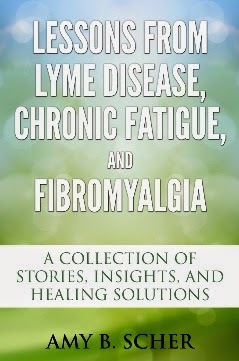 I, the author of My Lyme Treatment, will not accept any responsibility for the actions or consequential results of any action taken by any reader. The information provided in my blog is believed to be accurate to the best of my knowledge. 2014 . Simple theme. Powered by Blogger.